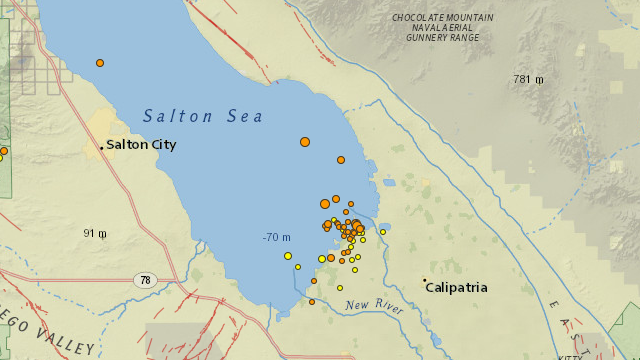 The Science of California's Seismic Pests, or Earthquake "Swarms"
Earlier this week, a cluster of dozens of little earthquakes occurred under the Salton Sea in southernmost California over the course of a couple of days. Most were too tiny to feel, and the largest—of magnitude 2.3—wasn't big enough to be remarked upon. Specialists call this kind of thing an earthquake swarm, and while it seems like swarms ought to be telling us something, nobody yet has figured out what. There are many kinds of movements going on in the deep earth, only some of which are earthquakes. (Others include tremor and creep and something in between called slow earthquakes.) Among earthquakes proper, the biggest ones are better understood than the rest—they're big ruptures, called mainshocks— followed by a host of aftershocks that are best thought of as the mainshock rupture settling down to a relaxed state. Mainshocks may have a few foreshocks as well. Think of foreshocks like the crackling of a tree limb before it breaks. Earthquake swarms were first noticed almost a century ago, and researchers were quick to associate them with volcanic regions, where movements of magma underground would be an obvious cause. As our earthquake records have grown, we've found swarms in all kinds of geologic settings. In a pair of papers in 2006, John Vidale studied hundreds of swarms in southern California and Japan and found that they occurred everywhere, not just near volcanoes. He and his colleagues found that the majority of earthquake bursts were a blend between pure mainshock-aftershock sequences and typical swarms. It comes as no surprise that Earth doesn't give us many clean test cases. Researchers have proposed two main mechanisms for earthquake swarms. One is that underground fluids under high pressure are cracking the rocks in small events. Like people in a crowded bus making room for a group of boarding passengers, the rocks respond to the migration of the fluids and their associated pressures. A recent study in Italy slightly favored that explanation for a swarm of over 5000 earthquakes that has been going on since 2010. This also makes sense for swarms that occur beneath volcanoes. In the Bay Area, we have a constant artificial earthquake swarm around The Geysers, where a large geothermal power plant is constantly pumping water down onto superheated volcanic rocks and harvesting the steam to generate electricity. The other explanation is that the swarms are a response to episodes of deep-seated creep (motion without ruptures) along major faults. A 2009 paper by Emily Roland and Jeffrey McGuire looked at the Salton Sea area, which has lots of earthquake swarms and the same kind of transform faults that characterize the whole San Andreas fault zone. They found that seismic activity spread along the surface of the faults at 100 to 1000 meters per hour, which matches the behavior of short-lived creep episodes. They also found that the ruptures were slower than regular earthquakes and produced a smaller drop in stress. They concluded that "these systematic properties could be used to improve real-time hazard estimates by detecting the existence of a swarm-like sequence relatively early in its evolution." That would be a nice thing to know, especially if the work can be applied to Bay Area earthquake swarms on the Hayward fault. In earth science, it's usually a good bet that when theorists offer two mechanisms for something, neither one will emerge as the single explanation. Instead, they'll be complementary. The history of geology suggests that we eventually find, like that old TV ad said, "You're both right!"